Wednesday began just like any other day, with me rolling out of bed at noon and having no concrete plans. Kambrie (my roommate/fellow Baylor student/navigational expert) and I went to our orientation for Boğaziçi University, where we met up with our friend Ben from California. The orientation was long and painful, and we left a few minutes early to avoid the rush of the approximately 300 other exchange students who were also ready to get out of there. On the way to the campus gate, we met another exchange student from Australia, and five minutes later we were good friends with him and had invited him to join us on a quest to find the best baklava place in the city (I had some abstract directions from wanderingearl.com, a travel blog that I follow pretty religiously). Surprisingly, we had a relatively easy time finding Güllüoğlu, the baklava shop. 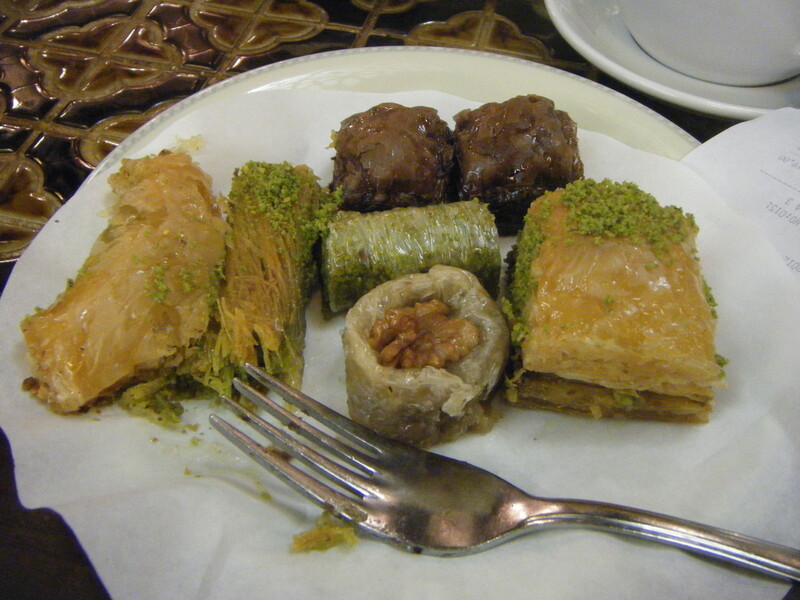 I am no baklava expert, but this stuff blew my mind. Every bite was sweet and perfect, from the pistachio to the walnut to the chocolate (yes, chocolate) baklava, which can only be described as a combination of brownie, baklava, and everything that is good in this world. After an hour of beautiful baklava, we moved on to a place nearby that Julian (the Australian) knew about, called Cihangir Park. 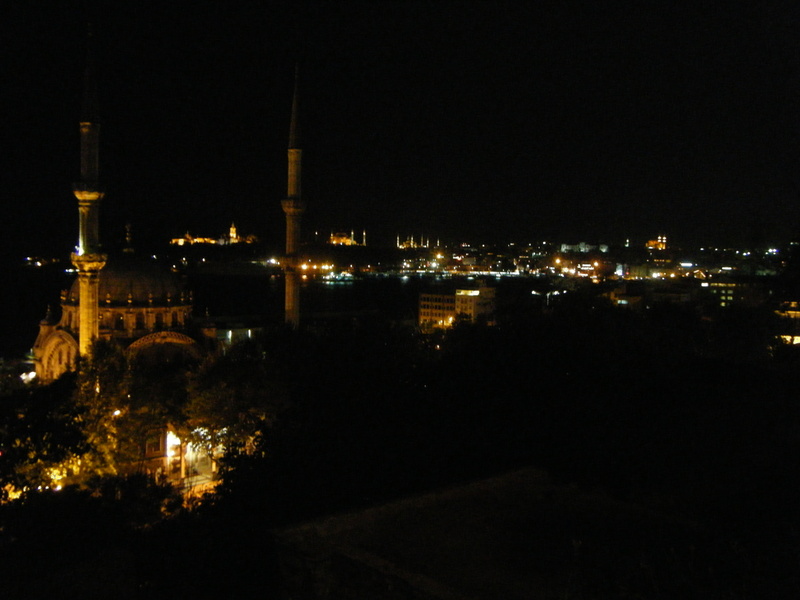 We sat there as we digested, listening to some Turkish guys playing guitar and singing, and looking at yet another gorgeous view of Istanbul. After an hour in Cihangir Park, we were ready to move on. 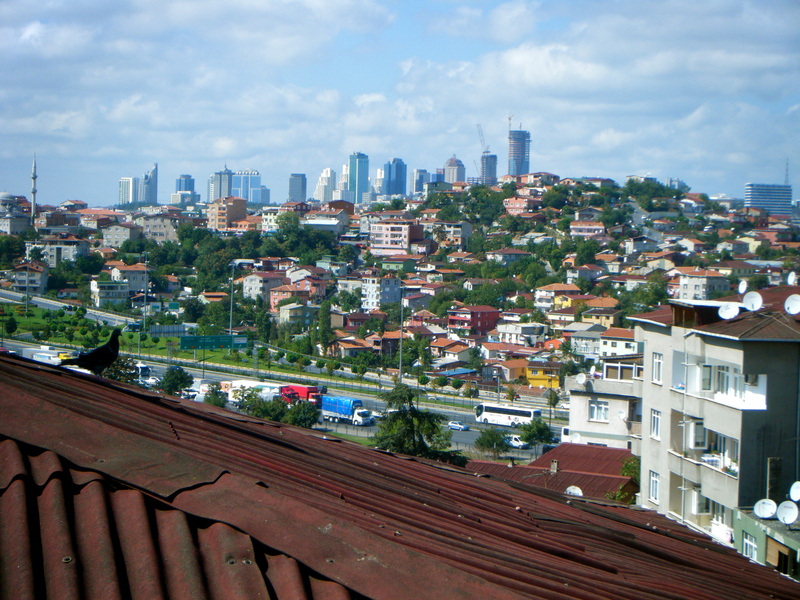 We walked to Taksim, which I have already described as one of the hoppin’ parts of the city. When we got there, we randomly ran into two of Julian’s friends, a Turkish couple. We quickly became friends with them because they were really cool, and they ended up taking us to this place called Araf, where we danced to live Balkan music (look it up, it’s awesome) for hours. By this time, it was very late (early, actually) so we all went to Julian’s apartment, which was within walking distance, and hung out with him and his roommates until the sun came up and the buses started running again, at which point Kambrie and I came home and slept until about 4 pm. I know I won’t be doing much more of these types of things once school starts, but looking back I’m so happy about Wednesday’s chain of events, which almost entirely revolved around making one random friend after he mistook my accent for an Australian one (that was a first for me). Random friendships such as this one which lead to random adventures such as the one I just described have been a trend since I’ve arrived in Istanbul, which have reinforced one fact over and over again– that life is pretty cool. Oh the joys of international traveling… Being in an airport in a country where your phone doesn’t work, with no legitimate wifi, unable to contact your future flatmates informing them of your half hour delay leaving London or the hour-long line in Turkish immigrations which will ultimately make you step out of the Istanbul airport half an hour later than you were supposed to be meeting said flatmates at the bus stop near the apartment. Not knowing which bus to get on, I asked the airport security guard with limited English skills for some help. And so began my adventures. With a cryptic message from the security guard (“hawatash, you go hawatash”), I began lugging my 50 pound suitcase down to where I could see a few taxis and buses waiting. One bus had “Havatas” written on it. Someone in line spoke English and I figured out that this bus could take me halfway to where I was going for 10 lira (about $5). I climbed on and sat for an hour in the awful traffic until we finally arrived at Taksim, one of the hoppin’ parts of town. By this point it was getting a little dark so I thought it would be safer to take a taxi the rest of the way. There were three taxis waiting at the bus stop. I got into one of them (in the front seat, as the driver had gestured to me) and we set off into the terrible traffic. About $10 later, we hadn’t made much progress, so I guess the driver felt bad about me spending so much money and told me that he would drop me off at the metro station and I could go to a station closer to where I would be living, where I could catch another taxi and spend less money. This particular driver happened to be a very touchy-feely guy (not in a good way), so I quickly took him up on that offer, jumping out of the taxi and dragging my suitcase across a busy road to the metro station. The metro station was underground, and as it was dark outside, I didn’t notice the handicapped elevator, which would have come in handy with my suitcase. So I started down what was basically three flights of stairs with this ridiculous suitcase, and people streaming both ways all around me. After a million years I made it to the bottom (but hey, down is easier than up) and I bought my metro token and rode to the station the cab driver had told me. Thankfully, the metro in Istanbul is almost identical to the one in Delhi, which I am very familiar with. I easily made it to the stop, but from there I was a little concerned about the whole taxi thing, plus it was 8:30 PM and very dark outside, so I went to a security guard in the metro station. This one spoke little to no English, but I showed him the address I had written down, pointed up and said, “taxi there?” This guy was awesome. He showed me all the way up to the road, where he made sure I had Turkish money and then flagged down a taxi for me and told the driver where I needed to go. I climbed into my second taxi (the backseat, which I will continue to do for the rest of my life), and the driver was somehow able to find my address. Hoping that I was at the right place, I got out and rang the bell for the fifth floor, where I would be living. My awesome Turkish flatmate came down and helped me carry my bag up the five-story spiral staircase. This suitcase will not be going anywhere else until I leave Turkey, because that whole trip was ridiculous. My second flatmate, another Baylor girl, arrived at the apartment soon after I did, and ever since then my Istanbul experience has been basically awesome. Life is so much less stressful when you aren’t toting around a giant suitcase. Already, I have made several new friends from various countries, learned a little Turkish, and gotten to see a little of what has got to be the most scenic city in the world. If you stand on the top of any hill (and there are a lot of them), you will have an amazing view, guaranteed. Today is my third day in Turkey, and based on what I’ve seen so far, this unique and wonderful city will give me many stories to tell. So I will see you again very soon.